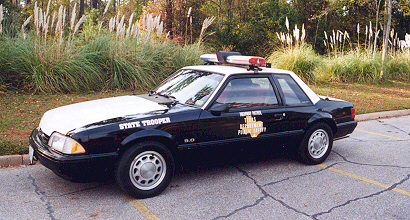 This is a 1993 Texas Highway Patrol Mustang. It was issued to and driven by Trooper D.B. Dunkin, THP-Lufkin. This Mustang was first used in Shelby county near Center by Trooper A.G. Corbell and then transferred to the hands of Trooper Dunkin to serve the Angelina & Trinity county areas of east Texas. This photo was made in the spring of 1997 and the mileage on the Mustang at the time of the photograph was 86,544. Photo location: 2400 block of West Frank Street in Lufkin, Texas. 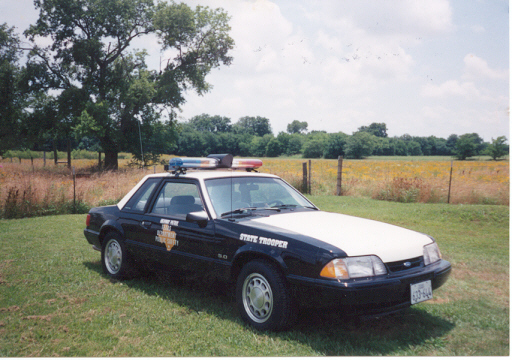 1993 was the only year that Texas DPS Mustang had "state trooper" on the front fenders. It is also the only year that the DPS Mustang did not have spotlights mounted on the A frames. 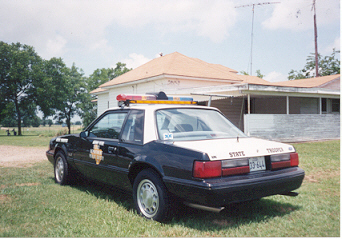 This is the back view of a 1993 Ford Police Mustang that was used by the Texas Highway Patrol. This unit was issued to and driven by Trooper Steven J. Sikes. This picture was actually just a quick snapshot made in Steve's driveway at his house in Diboll, Texas. This Mustang served the Texas citizens in the Angelina & Trinity county areas of deep east Texas. Trooper Sikes has since retired from the DPS (2002) and is working for a local agency now. Thanks for the use of your picture on our site, Steve. And thanks for the many years of dedicated service you gave to the Texas DPS and your coworkers! 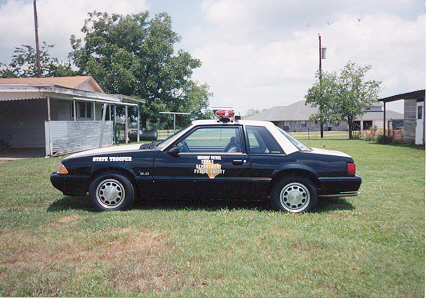 This is a photograph of several 1993 model Texas DPS Mustangs. This picture was made in the Fleet Operations sub-yard of the Texas Department of Public Safety Headquarters Complex in Austin, Texas. The pictured Mustangs have been retired and had equipment removed from the vehicle. These Mustangs eventually had their markings taken off and were taken on to the paint shop where they were painted solid colors and prepped for auction. These Mustangs were sold in the February 1998 auction. Picture date: October 1997. Note: The '93 DPS Mustang on the right side of the photograph sitting to the left of Jeep Cherokee is my Mustang before it was auctioned. When I took this picture, I had no idea that I would own this Mustang 11 months later! 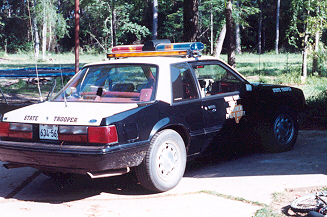 Above: This is a 1993 Texas DPS Mustang as it was still in service. This Mustang was used in the Angelina-Trinity county areas of east Texas. This Mustang was assigned to Trooper Bo Dunkin, THP-Lufkin. Fleet # M93-360. This is a 1993 Texas DPS Mustang. These three pictures come to us courtesy of Mr. Joe Pell. Above: A 1993 Texas DPS Mustang is photographed sitting at a strip mall in Katy, Texas west of Houston. Photo courtesy of Tom Mallette. Below: The interior view of a '93 Texas DPS Mustang as it sits at a Fun Ford Weekend event in Baytown. Picture date unknown. Photo courtesy of Tom Mallette.